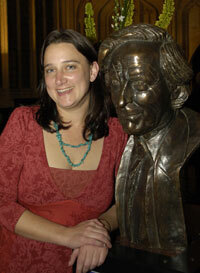 South African writer Henrietta Rose-Innes has won the 2008 Caine Prize for African writing for her short story “Poison”. Henrietta won the 2007 HSBC/SA PEN Literary Award for “Poison” which was published in African Pens, one of a series of books of new creative writing which showcased selected contributions to the 2007 HSBC / SA PEN competition. Henrietta was born in Cape Town and obtained her MA in Creative Writing at the University of Cape Town, after studying archaeology and biological anthropology. Her first novel Shark’s Egg was published in 2000 and her second, The Rock Alphabet, appeared in various publications. She has also compiled an anthology of South African Writing, Nice Times! A book of South African pleasures and delights (2006). In 2007 and 2008 she was a fellow at the Akademie Schloss Solitude, Stuttgart. Anthony Fleischer, president of South African Centre of International PEN congratulated Henrietta and said that her literary achievements contributed great value to the campaign to encourage new writing in Africa. He said that SA PEN has published eight volumes of new writing over the years, with contributions from many distinguished writers. Fleischer also congratulated Stanley Onjezani Kenani and Gill Schierhout who were on the 2008 Caine Prize shortlist of five authors. Their selected short stories were also published in African Pens. Earlier this year, SA PEN recently announced a new literary award to replace the HSBC / SA PEN Literary Award. The new award for original short stories in English will be known as the PEN / STUDZINSKI Literary Award. John Studzinski, a global investment banker and philanthropist, has generously donated the prize money. Nobel Laureate John Coetzee has agreed to be the final judge for the new award. Writers who are citizens of African countries are encouraged to begin preparing short stories for submission. There is no age limit. Further information and detailed rules of entry are available on the SA PEN website. The post-apocalyptic seems to be all the rage with readers of novels and short stories, both highbrow and low. On July 10th an international readers’ poll voted Midnight’s Children the best novel ever to win the Man Booker prize, which celebrates its 40th birthday this year. In the same week, Henrietta Rose-Innes (pictured right), a 36-year-old South African writer, won the “African Booker”, the £10,000 ($20,000) Caine prize for African writing, for a creepy short story entitled “Poison”. Sir Salman Rushdie’s most famous novel opens on the night India was partitioned, August 14th 1947, a date that amounted to the apocalypse for many. As a new border was drawn, hiving off Pakistan from India, hundreds of thousands of Muslims and Hindus were hacked to death in a frenzy of sectarian killing from which both nations have yet to recover. As independence dawned, few would have bet on a future of peace for the subcontinent, let alone prosperity. Midnight’s Children marked the end of Raj literature and the birth of a new and palpable post-colonial literary excitement. This reviewer remembers being so absorbed by the book when it first came out in 1981 that she forgot to get off the tube and ended up at the end of the Piccadilly line in the far north-east of London. In Ms Rose-Innes’s prize-winning “Poison”, it is not blood that fills the atmosphere but a toxic black grit-fallout from an explosion at a chemical factory that has emptied Cape Town of its inhabitants. Reminiscent of a post-apocalyptic work of an earlier generation, Nevil Shute’s On the Beach (1957), “Poison” explores a city where there is no power and no petrol; only birds falling dead “like lumps of some tarry black precipitate” from a sky thick with “bloody light”. Jude Kelly, chair of the judges, said the story showed “a sharp talent, a rare maturity and a poetic intelligence that is both subtle and deeply effective”.